The lands around the Mediterranean sea make up an idyllic setting where countryside, gastronomy, climate and people come together in unparalleled beauty. The sea has an effect on temperatures, meaning winters here are quite mild and the rest of the year enjoys very good weather. The Mediterranean sunlight shines down day in day out on spectacular landscapes, cooled down by the sea breeze; a land of excellent foods which make up a diet admired around the world. And, of course, wine is an essential part of this diet. From San Polo di Piave, in Veneto in Italy, the Casa Belfi Bianco delle Venezie wine brings the essence of the Mediterranean to this corner of the Adriatic sea. Its purity, aromas of fruit tree blossom, and a fine salinity transport us to a land where time seems to pass more slowly and life is waiting to be lived and enjoyed. Moving south and westwards, we come across the small village of Odena in the Iberian peninsula. Fragrances from local Mediterranean forestland embellish the well-known southern red grape, the Grenache, in the Exedra wine. Environmentally-friendly cultivation and as little intervention as possible in the cellar, allow us to enjoy the pure essence of these lands in every bottle of this organic wine. Even further south, located between Valencia and Elche, Celler del Roure is one of the wineries which has worked the most with local vineyards over recent years, specializing in local grapes such as the Mandó and Monastrell. Though these two grapes share a geographical origin, they offer two very different aromatic profiles. A perfect combination of them makes it possible to produce a wine with all the subtlety and complexity of the Parotet. Seductive is by far the best way to define this Casa Belfi Bianco delle Venezie wine. The golden orangey colour it has gained from three days working the must with grape skins seduces the eye, whereas the aromas of fruit tree blossom such as orange flowers and lime charm the nose. The grapes are grown using biodynamic cultivation methods in pebble covered vineyards in San Polo di Piave, in the province of Treviso. Local yeasts are used and the resulting wine is very agile in the mouth, but also complex. A smooth, lively, and sprightly wine, yet delicate at the same time. Its partial fermentation in oak barrels leaves barely a trace of wood while the natural stabilization the cold winter brings about, together with the fact that it is unfiltered, leads to a slightly cloudy finish. A fresh citrus flavour of kumquat embellishes its mouth, which is surprisingly fatty despite its low alcohol content. It is brimming with energy, stimulating the sides of the tongue which react enthusiastically to the fine salt and delicate hints of lime. Chardonnay grapes provide the Casa Belfi Bianco delle Venezie with body and reminiscences of green apples while the Incrocio Manzoni variety gives it a more delicate and floral touch. An excellent wine to accompany an oily fish meal, or roast turkey or chicken in a white sauce or with lemon. Alternatively it also makes for an excellent aperitif wine. Once you try this wine, we're sure you'll agree with us in that it is of a quality rarely seen in this price range. The Exedra is a Grenache wine from Mediterranean woodland. A wine based on grapes from natural vines, organically farmed, within fragrant surroundings and as little intervention as possible during the production process. The resulting wine shows off the pure essence of these landscapes from the very first sip. A part of the Exedra is fermented and aged in clay, which is noticed in the wine's grainy feel, laying earthy shades over the pleasantness of the Grenache. It obtains a wild acidity thanks to the vineyards which are planted among woodland at a height of 650 metres. This acidity is noted straight away on the palate, although, after the first drink, it softens and the wraparound character of the grape comes to the front, presenting a fresh, airy, and lively wine. Exedra has an intense cherry colour in the glass and a silky feel, thrilling the nose with notes of blackcurrant and raspberry jam, pepper, and fine candy. Herbs of Provence and aromas of clay remind us of its terroir and round off a dreamy set of aromas. Bottled unfiltered, this wine keeps the minerality typical of the chalky soils where its old vines grow. Lengthy and enveloping in the mouth thanks to the time it stands on its lees, it is also a wine which will age well to become a rounder wine, but one with less fresh fruit. Whenever you drink it, now or later, the Exedra is an elegant and harmonious wine with a strong personality and unique character. Parotet is an ode to fruit; an ode to traditional grape varieties, the tantalizing red colour of wine, its soil and the freshness of Mediterranean mountain-lands. A homage to wines from another time. The fruit is fermented with part of its stalks using local yeasts in traditional stone presses, and then aged in 2,600-litre jars buried under ground. 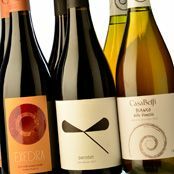 Seventy-five percent of the wine comes from a virtually extinct grape variety, Mandó, while Monastrell makes up the remaining quarter. They blend perfectly to give body and shape to a wine which faces the sea from vineyards 550 metres up on the mountain slopes rooted in the sandy soil of this Valencian terroir. The Mandó grape gives it aromas of flowers, fallen leaves, and a certain sponginess while the Monsatrell imprints notes of maturity, intense fruit, and hardiness. What stands out most about the Parotet is the ripe wild fruit and hints of southern scrubland. Slightly spiced notes join subtle aromas of violets to surround the pleasantness of this wine with southern warmth, but it still retains its freshness. A balsamic wine with typicity but not an over-mature one. Its time spent in jars means the wine is bottled with its crispy and fragrant fruitiness intact. Gentle in the mouth, it is a somewhat lactic, or milky, wine which is easy and delicate when first sipped, though elegant rustic tannins and a delightful acidity soon appear on the scene. It has a bitter, dry finish as you'd expect with a wine which has a long life awaiting it. The wine is called Parotet after the word in Catalan for a small kind of dragonfly. Just like the insect, it is a graceful, agile, and elegant wine — a faithful image of the wonderful landscapes which saw its birth.